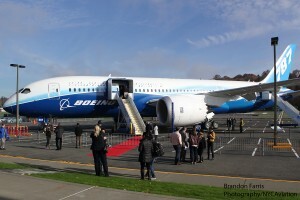 “Incredible,” “amazing” and “unbelievable” were all words repeatedly said by visitors to the Museum of Flight in Seattle on Saturday while onboard tours of ZA003 – Boeing’s third 787 flight test aircraft — as the museum became the first in the world to receive and showcase the new state-of-the-art aircraft. While only initially open this weekend, the aircraft will eventually will be open once again to the public on November 22. 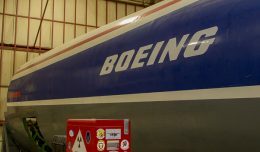 By then, the aircraft will be placed in a more appropriate spot until its final resting place is constructed across the street from the museum; it will be on display with many other historic aircraft from the Concorde to the first-ever produced 747. 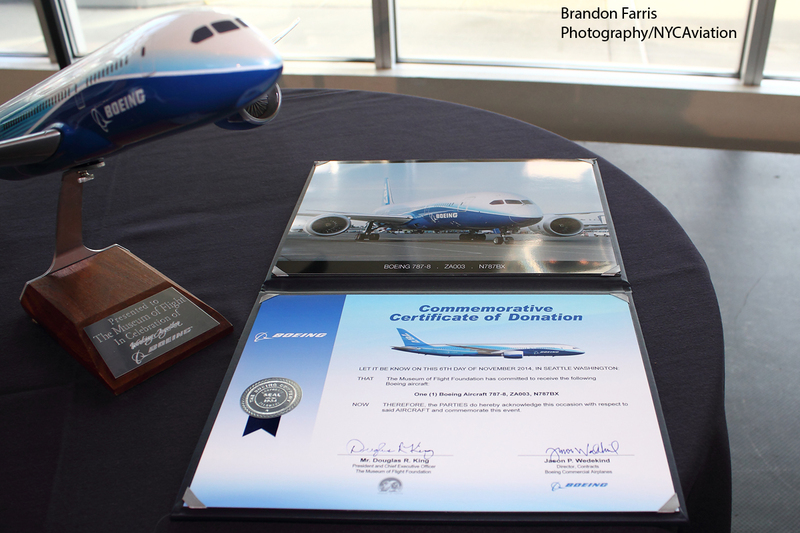 “A world class airplane for a world class museum,” said Randy Neville, one of the chief test pilots for the 787 certification program. 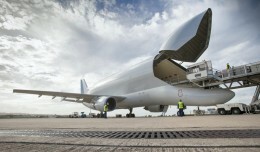 Several hundred people were on hand for the special handover ceremony before the aircraft was opened to media and visitors. The line stretched several hundred people deep with people of all ages at its peak with a wait time of approximately two hours, giving an enthusiastic welcome to the Dreamliner. It was reported by the museum that total attendance on Saturday was in excess of around 6,000 guests to see and step aboard the museum’s newest attraction. ZA003 took part in several extremely important milestones for the program from cold weather testing to the extreme heat testing. It made the first ever airshow appearance for Boeing at the 2010 Farnborough Airshow. 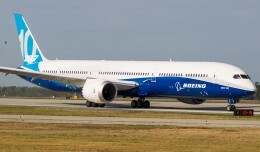 After Boeing announced that ZA003 would go on a world tour to showcase the aircraft to future 787 operators, the aircraft received a unique new interior and was repainted from the test scheme to full Boeing house colors. 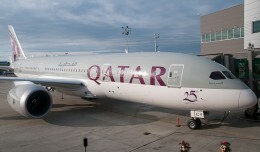 NYCAviation flew onboard ZA003 during that tour. 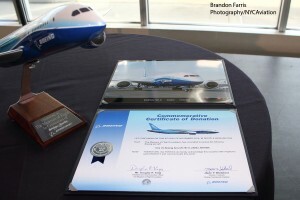 During the event, Boeing Vice President Larry Loftis confirmed that ZA001 and ZA002 will indeed be donated to museums as well, but to which museums is still unknown. 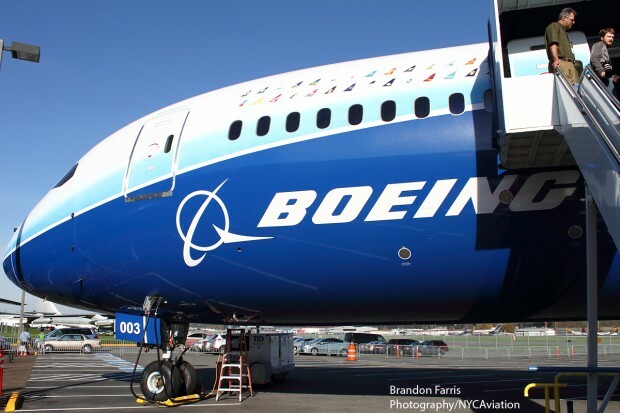 Popular speculation suggests that ZA001 will go to the Smithsonian Museum in Washington, DC, while ZA002 is believed to be Japan-bound to the Tokyo Museum of Flight. The latter destination is especially fitting, as ZA002 features the livery of launch customer All Nippon Airways. Brandon Farris is a Northwest-based aviation photojournalist who has a love and extreme passion for aviation and Major League Soccer. To see more of his work, check out his Flickr or contact him via email.